The corrosion of components is a pervasive problem which destroys or reduces the structural integrity of equipment and parts used in all industries and in all environments. 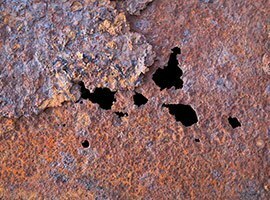 Corrosion can be as simple as steel rusting when left unprotected against the weather or as complicated as a high rate chemical attack by corrosive chemicals utilized in a process or as a by-product of processes. Corrosion protection coatings can function by: sealing a surface from contact by corrosive chemicals, adding a layer of cathodic protection, or modifying the surface with a more corrosion resistant material. Cathodic protection coatings consist of a layer of a more electrochemically active material applied to a corrosion vulnerable metal surface. These materials are selected because they have a more “active” voltage than the metal of the target structure (typically steel). On their own, cathodic protection coatings will corrode, consuming the coating material until eventually they must be replaced. Barrier coatings consist of a layer of more corrosion resistant material applied to a corrosion vulnerable surface. These materials provide a barrier of corrosion protection due to their corrosion resistant properties. Low porosity levels of the coatings combined with the use of sealers add to the success of these coatings in corrosive environments. In many applications, both corrosion and wear are a recurring problem. Ceramic and metal cermet materials which are comprised of hard wear/abrasion resistant materials such as carbides combined with corrosion resistant binders, such as nickel or chrome, are one solution to this problem. Another is ceramics such as chromium oxide or alumina titania which are inherently hard and corrosion resistant. The main benefits of corrosion protection include high wear resistant, lengthening the service lifespan, as well as better protection against aggressive environments such as immersion in sea water. Corrosion is a huge issue for steel products and that is why you will see corrosion protection coatings used for endless applications across all industries. If you require the use of steel parts in the outdoors, applying layers of corrosion protection coatings to these parts will help to ensure a long-lasting service lifespan. For example, steel parts used in pipelines, overhead bridges, offshore platforms and ships can benefit greatly from corrosion protection coatings. A&A Coatings is a unique plant devoted exclusively to the application of metal, ceramic, cermet and hard faced coatings. Years of experience with these processes led to the advancement of our coatings to provide the best corrosion resistance. Contact us today for more information if you need corrosion protection for your business-specific applications.